Former Dexter star Julie Benz, talks about her new TV Show, 'Defiance' which begins on April 15, Dexter and more. Check out her interview for Gotham Magazine, below. One cool thing about Defiance, which premieres April 15, is that it's both a television series and a video game. What was it about the show that appealed to you as an actress? JB: Well, the scripts were really good, and I was looking for a strong female character to play. Especially the older you get as a woman, that's harder to find. Most scripts I get sent to me are victim, mother, wife. To find a character that was none of those things, and dynamic, and in a position of power is rare. Skip the jump, for more. 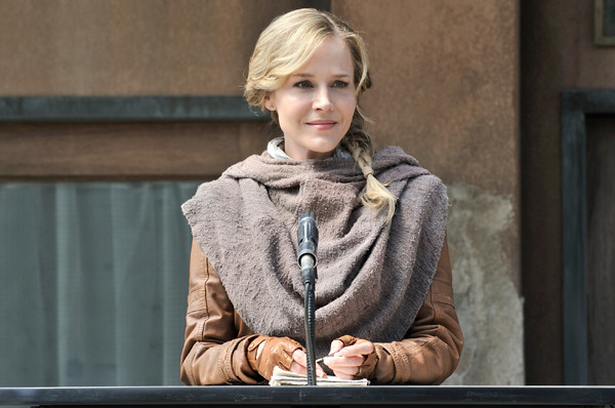 Your character Amanda really is in a power position, she's the mayor of Defiance? JB: Yes, the newly appointed mayor, which means that she's in a little bit over her head. Amanda wasn't really groomed to become a mayor—she's not a politician by nature. She was appointed because the old mayor became sick, so she took over until they have another election. She's an idealist. She really believes humans and aliens can live peacefully together as one. She's tough, too. Nice. Can you relate to that sense of being in over your head? JB: I feel like I'm in over my head every single day! As an actor, every role is monumental in some way and it can be overwhelming. What is it like when a role comes to an end? Was Rita Morgan on Dexter hard to let go of when the character died? JB: I did struggle with a certain level of grief and mourning over Rita because it was unexpected to me, it was really sudden. I only found out right before they put out the last script. And I felt sad, because she was never coming back to life. She was human and she was dead and I'd never get to play her again. All of my other characters I've played in the sci-fi genre have had supernatural abilities, so even though they died they came back to life. So there was this weird mourning period I had to go through.